The state of Utah has completed a proposed revision to regulations of outdoor wood boilers that sought to balance the interest of its main stakeholders: families that have boilers and their neighbors and the interests of the state to reduce particulates in non-attainment areas. The core of the regulation proposes that new installations of boilers not be allowed in Utah’s non-attainment areas except for families who currently own an outdoor boiler, who can replace it in the future with a Phase 2 unit. In the attainment areas, Phase 2 wood units can be installed provided they meet setback rules. The Alliance for Green Heat supports the proposed regulations and has commented and provided expertise to the state. 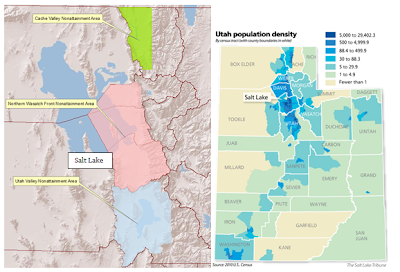 The Alliance notes that the non-attainment areas are mainly the more densely populated areas of the state around the largest cities – Salt Lake City, West Valley City and Provo - where demand for outdoor boilers is lowest and health implications are highest. In the rural areas, Phase 2 units would be allowed. 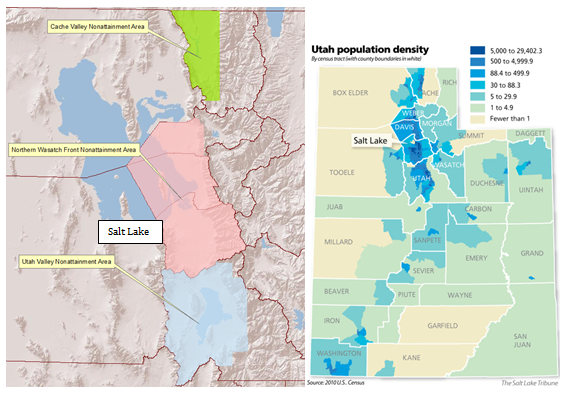 The maps below show the correlation between population density and the non-attainment areas. In response to the first proposed regulations, Central Boiler argued that the “rule lacks scientific support and would unfairly prohibit Utah residents from purchasing and using clean-burning wood furnaces.” A main thrust of Central Boilers argument is that Phase 2 boilers “are cleaner than EPA certified wood stoves.” Specifically they claim that “average emissions for a Phase 2 OHH are 77% less than those from EPA-Certified woodstoves.” The full submission by Central Boiler can be found here. The Alliance for Green Heat supports regulations in all states that would only allow the installation of Phase 2 outdoor boilers and setbacks or other regulations, like the Utah ones, that prevent their installation in densely inhabited areas. “The main problem with Phase 2 wood boilers is certainly not how they operate in the lab using dry crib wood,” said John Ackerly, the Alliance’s President. “The problem is that their often oversized fireboxes are too frequently loaded with large, un-split and unseasoned logs. With wood stoves, the fireboxes are much smaller and the wood is much more likely to be split and seasoned better,” Ackerly added. The main elements of Utah’s proposed revisions have been made public but still have to go through Air Quality Board. Some of the details will only be public in November during the public comment period for the revised rule. Click here for an overview of state outdoor boiler regulations. A prohibition on certain fuels. Setback and stack height requirements. Visible emission standards that are identical to the ones for wood stoves that have been regulated for many years. Labeling requirements for new boilers. In attainment areas only: future sale of only Phase 2 complaint or pellet boilers. In nonattainment areas, anyone wishing to replace an existing unit must: register the existing unit with DAQ and replace it with only Phase 2 complaint or pellet boilers. No new sales will be allowed after March 1, 2013. Vermont Castings, England Stove Works and Fireplace Products International (FPI) were each fined $49,000 for NSPS violations by the EPA enforcement division. In addition, New Buck Stoves was fined $35,000 and Travis and Sun Spot received very small fines. Click here to view a list of wood stove violations and fines that we believed were issued in the last eight to twelve years. As part of its responsibility to enforce the NSPS, the EPA inspects wood stove manufacturers and levies fines on companies that have not complied with the record keeping and other requirements. The Alliance for Green Heat obtained records from the EPA about which companies have been fined. Most of the companies were fined for recordkeeping violations. FPI was fined for a labeling violation. Separate from the $49,000 recordkeeping violation, Vermont Castings was also fined $13,000 for a sealed stove violation. Two of the companies, FPI and England Stove Works, paid part of their violation in cash and part in stoves. The stoves were provided to a Supplemental Environmental Project (SEP) to install in low-income households. The Clean Air Act provides minimum amounts that the EPA will accept in settlement of enforcement actions. For example, “use of incorrect information on a permanent label” can be settled for “$1,000 per model line and $10 per stove.” Failure to maintain sales records can cost a company $1,000. Failure to conduct an emission test quality assurance program is $500 per stove not tested as required. And, if a manufacturer advertises for sale, or sells a stove without permanent label or certification test, the fee is $3,000 per model line and $30 per stove manufactured. Click here for a copy of the EPA's policies and procedures for fining stove manufacturers. We often run material from the Firewood Association of Australia because it's a great example of what a national firewood association can do to ensure dry wood is being delivered. This story is about overall firewood supply - and reports that one dealer is mixing in green wood. "Reports from around the country are that this is shaping up to be a much better average firewood season. The ACT is on track for a record year, which is not surprising given below temperatures they have been experiencing. Supplies of good quality red gum into Melbourne and Adelaide are still readily available at this stage, which is an improvement from last year! Supply into Sydney seems to be just keeping pace with demand, which is well up on the same time last year. Only a couple of negative are the wet weather in Queensland which has restricted access to the main western ironbark resources for the Brisbane marker and the shift to green log supply by the FPC in Western Australia that is still causing some concerns. We also hear that one red gum supplier (not a FAA member) has started mixing green wood into semi-loads to extend his supply. This is really regrettable as it undoes a lot of the good work put in by our members to build on the reputation of red gum as a top quality seasoned firewood." The Efficiency Debate: Required or Reported? Many of us in the wood heating community have learned a lot about efficiency lately. We’ve learned that pellet stoves appear to be less efficient than wood stoves, when many of us thought they were more efficient, including the EPA. We’ve learned that possibly up to half of all wood stoves on the market today would not pass a 70% HHV minimum efficient threshold – even though they all met a 75% LHV threshold for the tax credit in 2011. And, we learned that industry is gearing up to fight a minimum efficiency requirement in favor of just reporting the efficiency. The Alliance for Green Heat believes that a minimum efficiency standard is needed, no question. The only question is where the bar should be set and when. Minimum efficiency requirements are becoming standard for major appliances and we believe wood and pellet stoves are better served by being part of the energy efficiency mainstream, not fighting to be outside of it. A 70% minimum is likely the best minimum efficiency to include in this NSPS and the debate should center on how long manufacturers have to meet that minimum. One option is to say stoves must be 65% efficient a year or two after promulgation and 70% within several years after that. Then, we think it’s vital that our industry have an Energy Star program that recognizes the most efficient and cleanest stoves. This will help consumers and our industry gain greater support from policy makers, regulators, the environmental community and the general public. One reason minimum efficiency standards are needed is that the cheap price tag on inefficient products in Asia often is greater selling point than its efficiency label. Are the high quality domestic stoves producers really willing to compete with cheap, inefficient stoves for the next 10 or 20 years? This would be a great disservice to an industry that is still dominated by high quality domestic manufacturers. The EPA has been far too slow and timid in establishing the regulations that will help propel this industry forward. The first NSPS was a lifeline for this industry and this NSPS can be just as beneficial. This NSPS could help propel wood and pellet stoves into the mainstream of the renewable energy movement. Look at the example of Europe. Efficiency standards have gone hand in hand with soaring sales of more efficient wood and pellet equipment. There are pellet stoves on the market today that are under 50% efficient and even below 40%. Imagine those families who keep pouring 40 pound bags of pellets into an appliance that is half the efficiency of what it could and should be. Wood and pellet stoves appeal to Americans because they save them money. It’s all about efficiency. Does the industry really want to publicly fight against a minimum efficiency standard that will save consumers millions of dollars? Wood stoves are beginning to be formally included in standards used by energy auditors, which will lead to energy auditors recommending that old stoves be upgraded. This initiative marks a new strategy in the movement to change-out millions of inefficient and polluting uncertified wood stoves. The first standard that instructs energy auditors to inspect wood stoves was developed and issued by the Building Performance Institute (BPI) at the request of the Alliance for Green Heat, who drafted the language. The Home Energy Auditing Standard (BPI-1100-T-2012) now includes two provisions for wood stoves and other solid fuel burning devices. The inclusion of 7.8 and 7.23 followed a meeting between John Dupree, the EPA wood stove NSPS compliance lead, John Jones, BPI National Technical Director and staff of the Alliance for Green Heat. Much more detail about how stoves should be inspected and assessed will be followed in BPI Basic Analysis of Buildings Standard 1200-S. The Alliance for Green Heat is in the process of reaching out to HPBA and relevant institutions to form a working group to help draft provisions this standard, a companion piece to BPI-1100-T-2012 that outlines how energy auditors shall meet the requirements listed. It is expected to be finished later this year. BPI-1100-T-2012 is also in the process of becoming an American National Standards Institute (ANSI) standard, which are commonly adopted by state agencies such as NYSERDA. The standard represents a major step forward in the Alliance for Green Heat’s mission to make wood stove inspections a routine part of home energy audits. Energy auditors could be assessing fuel savings by switching from oil to wood or pellets, testing wood for moisture, recommending chimney cleanings and generally helping to educate homeowners about clean burn practices.